This Compilation ℗ and © 2017 Madison Gate Records, Inc. All Rights Reserved. The adolescent antagonism between ecstasy and sorrow on this track is as clear as daylight and the transition from songs 15 to 16 is a wistful, devastating portrait of finding the assurance to tell someone you love them only after it's too late. The listener wears Elio's skin and darts around between his ears like the ring of a piano until this turning point, which passes, as it does in the film, like the cruelty of partition. I was very fortunate to have an experience like Oliver and Elio. I was Elio. My Oliver was a 17 year old and I was thirteen. As I read the book, I was immediately transported to my own summer in Italy where I met Giancarlo en Firenze. I had taken a trip ride vacation through northern Italy in 1993. I began my holiday seeing my diva, Diana Ross in Milan. Milan was bustling with trolley cars and locals rushing to work in the galleries, fashion boutiques, etc. Diana was divine as always. “Mahogany” was partially filmed in Italy so she sorta had honorary citizenship. The Italian audiences embraced my diva, my star! in a way that Europe traditionally loved true Divas. I took the train next to Venice and listened to Annie Lennox’s “Diva”....wandering through St. Mark’s Square and riding the gondolas listening to “The Gift”. It was onto Firenze next where I had my own “Call Me By Your Name” Moments. I promised myself to return to Bologna, the college town. But onto the soundtrack as I’m sure eyes have rolled. I was first introduced to Sufjan Stevens in 2003. 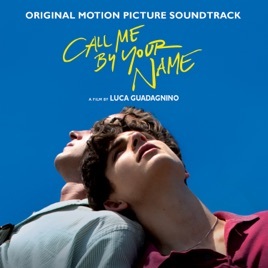 “Mystery of Love” that plays over the main trailer is entrancing. The ever engaging Mr. Sakamoto dramatically captures Elio’s transcribing throughout the movie. I’ve seen so many different scenes and watched so many different interviews with heartthrob Armie Hammer and delicately innocent Thimothee Chamalett that I almost can confidently call this my favorite movie of the year! And this wonderful soundtrack and score doesn’t disappoint! I had anxiously bee awaiting this soundtrack. I thought it was coming out in a couple of weeks. It was serendipitous that I decided to look on iTunes this Sunday, 5th of November Morn. The physical CD is already out of stock at Amazon. Wonderful mix of music. Some of the instrumental pieces are stunning, and the Sufjan Stevens songs pretty much rip your heart right out. Takes you right back to the emotion of the film, which is what any great soundtrack is meant to do. Bravo.